As Mozambique continues to establish itself on the global travel map, exciting new tourist regions are springing up. One of these areas is Inhambane, a small city on the southeast coast about 290 miles (470km) north of Maputo and easily accessed by a tarred road. Previously, tourists merely passed through Inhambane on their way to the beaches of Tofo, Cocos, and Barra. These days, more and more are stopping over to savour the historic city, with its sleepy atmosphere and faded colonial architecture. Tourist attractions in Inhambane include the Church of our Lady of Conception. It's a 175-year-old building that features a ladder stretching up to its topmost spire, offering panoramic views of the old quarter and harbour. The Mercado Central is a market where colourful arrays of fresh produce are for sale. Adventurous travellers can strike out for more remote areas of the province, where picturesque villages and mangrove swamps lie in wait. Most tourist activities like diving, snorkelling, and whale-spotting take place at the beaches located about 14 miles (22km) up the coast. 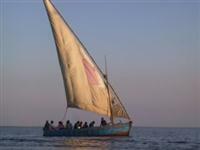 But tourists should enjoy a traditional dhow ride to the historic trading port Maxixe, a larger city across the bay. Of particular interest to those planning a tour around southern Africa is the fact that Inhambane is a direct flight away from Johannesburg's OR Tambo International Airport.